March 16, 2014 — Audio, photo and recap by Managing Editor Jacob Seelman for Speed77 Radio and Race Chaser Online — NEWTON, NC — Call him psychic if you want, but Josh Berry made a prediction before Saturday night’s NASCAR WHELEN All-American Series Late Model Stock feature, and proceded to back in up in impressive fashion. “I’m predicting a JRM one-two finish tonight,” Berry said following qualifying. After qualifying on pole position following Doug Barnes Jr.’s disqualification from the qualifying order, Berry dropped back behind 18-year-old Landon Huffman on the initial start before charging back to the front of the field, taking the lead back from Huffman on Lap 23 and driving away to Victory Lane over his teammate William Byron and Huffman at the conclusion of 50 laps. 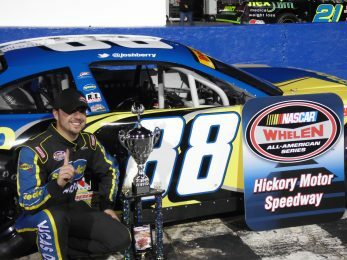 Berry finished fourth last week to open the points season at Hickory, and said that even a top five ‘wasn’t good enough’, and drove him to push harder this time around. 16-year-old Byron was overjoyed with his second straight top two finish in his second career Late Model start, assuming the track points lead by two points over his teammate Berry. Shane Lee and Ashley Huffman rounded out the top five in the LMSC class in a race that ran green-to-checkered without a caution flag. For the lack of melees that the Late Model Stocks had, however; the Limited Late Model (LLM) class more than made up for it. Casey Pierce started the afternoon from pole but the field was slowed immediately by a hard crash in Turn One on the opening lap, when Jeremy Pelfrey, who finished second last week at Hickory, had a right front suspension failure and pounded the outside wall, destroying his No. 51 machine. Following a red flag to reset the grid and clean up the aftermath of the incident, the field resumed under the green flag and Pierce and Dylon Wilson jetted out in front of the rest of the field before a second caution flew at Lap 7 for heavy smoke from the No. 15 machine of Sheflon Clay. A third caution came out for a multi-car spin involving the 11 of Dillon Houser and the 37 of Chris Phipps on the frontstretch before the field was able to get a long stretch of green flag racing in. Once the green lights came back on at lap 11, Wilson and Pierce resumed their titanic battle at the front of the field, changing the lead between themselves on two consecutive laps before Pierce began pulling away at Lap 12. The front pair stayed that way past halfway and up through the ten to go signal at Lap 25 but Wilson slowly began reeling in the 18 of Pierce again, and at Lap 26, peeked to the inside in Turn 1 to try and get the upper hand. A lap later, he was successful, driving around the inside of the Pierce machine and setting sail to just over a second’s victory ahead of Pierce at the checkered flag. Ross Dalton, division points leader Travis Byrd and Taylor Stricklin made up the rest of the top five. Spencer Boyd drove the J&J Motorsports No. 09 Super Truck from pole position to victory lane, leading all 35 laps in the class’ season debut at Hickory, and Kevin Townsend scored his second straight victory in the Street Stock class to round out the evening’s action. The Hickory Motor Speedway will be in action next Saturday, March 22nd for their next slate of events highlighted by the 125 lap main event for the new KOMA Unwind Modified Madness Series as well as features for the Southeast Super Trucks and East Coast Flat Head Series.